Wormwoodiana: Invoking the Angels - Machen's Original Vegetarian Restaurant? Invoking the Angels - Machen's Original Vegetarian Restaurant? 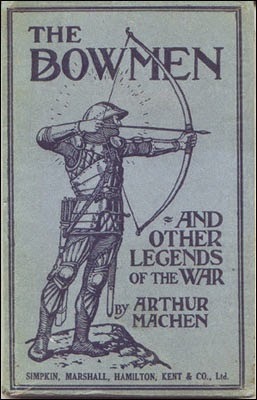 In his story ‘The Bowmen’, which gave rise to the Angels of Mons legends, Arthur Machen uses an unusual device to invoke the ghostly archers of Agincourt who come to the aid of the hard-pressed Allied soldiers at Mons. As a lifelong vegetarian and Machen enthusiast, I have always found this passage rather peculiar. Machen himself was far from vegetarian and could have chosen any number of other sources for the Latin quotation – from a school motto, perhaps, or a coat-of-arms seen in a church or ancient house. The very particularity of the passage made me think that Machen was here writing from personal experience – that he actually had seen plates in a vegetarian restaurant with just such a design. Now an article in the latest Newsletter (No 73, January 2015) of the Edward Thomas Fellowship, may provide the solution to this little mystery. Shahed Power & Shaun Theobald, in ‘Edward Thomas Dining With Friends in London’, present a survey of places that the poet and essayist is known to have frequented. Amongst these, they describe St George’s Restaurant, a vegetarian venue owned by the real tennis champion Eustace Miles, who, they discovered, also ran the Pure Food Stores. St George’s was, it appeared, a regular haunt of literary figures, journalists and bohemians, and they note Thomas often went there on his weekly visits to London looking for reviewing and other work. Thomas, the article notes, described the restaurant to his friend the American poet Robert Frost as in St Martin’s Lane and upstairs, while another poet, Ralph Hodgson, told Frost it was “next to the Coliseum in St Martin’s Lane close by Trafalgar Square”. The essayists have also uncovered a description of St George’s in Dinners and Diners: Where and How to Dine in London (1899) by Lt.Col. [Nathaniel] Newnham- Davis. Davis was also the author of Jadoo (1898), a now rare novel of Indian sorcery, as well as comic novels and other books on food. He evokes the eating place as follows: “a red brick building of an Elizabethan type, with leaded glass windows and with a sign, whereon was inscribed “The famous house for coffee,” swinging from a wrought-iron support. The windows on the ground floor had palms in them, and the gaze of the vulgar was kept from the inner arcane by neat little curtains….The room on the first floor was a nice bright little room, with white overmantels to the fireplaces, with one corner turned into a bamboo arbour, with painted tambourines and little mandolins and pictures, and an oaken clock on the light-papered walls, with red-shaded candles on the tables…”. The article notes that Edward Thomas’s diaries show that he had tea at St George’s at various times with “Ralph Hodgson, Arthur Ransome, W.H. Hudson, W.H. Davies, Walter de la Mare…Rupert Brooke, Robert Frost and D.H. Lawrence” and they conclude that the restaurant must have been a “de facto salon” for writers. When Machen was himself a working journalist and keen to find other literary work, in the years just before the Great War, perhaps he might, after all, have mingled there too. Interesting, as it opens up a larger view of London, the time and the mindset. Dear imaginary fule, indeed, excellent!